Bagsby is certainly one of the most interesting composers to come out of Tulsa, and also one of the most eccentric. While his training at the University of Tulsa in composition gives him academic credibility, his bizarre sense of humor and interest in this car wreck of a culture we call "Tulsa" places him somewhere between Mike Oldfield and "Weird Al" Yankovic. This third part to his Tulsa Trilogy, following hot on the heels of The Tulsa Project by Squid Pro Quo and Jethro Tulsa: The Magic Empire Strikes Back, is another pun-filled collision of art rock and Tulsa nostalgia. The CD is a 40+ minute suite featuring such subtitles as "The Southern Hillbillies, "Shadow Mountain Breakdown," "Traffic Circle Jerk," "Starship," and "Hissom School District." 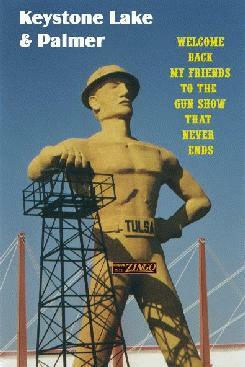 Bagsby twists Tulsa TV themes from the likes of "Mr. Zing and Tuffy" and "The Uncanny Film Festival and Camp Meeting" into a Zappaesque symphony that has more twists and turns that a ride on the Zingo. Bagsby often gets overlooked because people concentrate too much on the humor and fail to recognize the pure art of his music. This is old fashion art rock in the style of forgotten heroes of the seventies like Gong, Focus, or Magma (who did entire operatic albums in Esperanto). While the genre has diminished from best sellers (like Emerson, Lake, and Palmer and Jethro Tull) to a cult following, Bagsby is one of the few who still remembers how to create entertaining psychedelic symphonies that borrow from post-modern classical, jazz, and Spike Jones in equal parts. This is his best work to date. You might be too young to know the joy of driving around the surrealistic landscape of our city stoned in the 1970s with a Todd Rundgren 8-Track blaring, but this CD can magically transport you back to those trips to White's Records, Honest John's and The Rubicon. It's music to find your way off the traffic circle by. To order, visit David's new web site: Mad Scientist International.